Samtec helps address the challenges of next generation data rate requirements with industry-leading interconnect expertise, along with full system optimization services and support, including a vast library of development platforms and evaluation kits for high-performance interconnect systems. Samtec’s expanding line of proven High-Speed Mezzanine solutions engineered for 28 / 56 Gbps speeds includes extreme density arrays and ultra-high-density strips, along with optional mating cable systems. 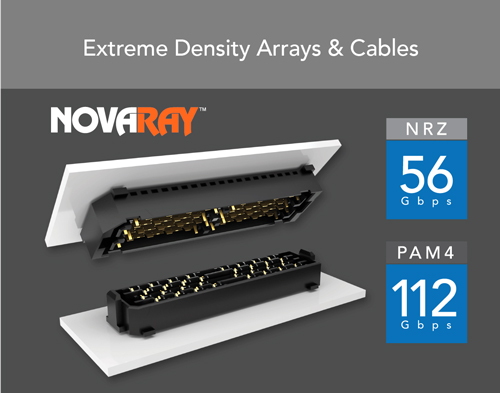 NovaRay™ Extreme Density Arrays are optimized for the demands of 56 Gbps systems and beyond, with a roadmap to 112 Gbps PAM4. Attributes include low crosstalk, tight impedance control and industry-leading data rates and density. Cable systems are also available. 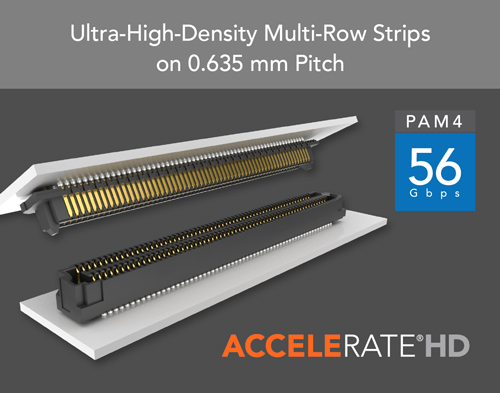 AcceleRate® HD Ultra-High-Density, Multi-Row Strips are incredibly dense with up to 240 total I/Os, a slim 5 mm width, and a low 5 mm stack height. Edge Rate® contacts are optimized for signal integrity and enable support of 56 Gbps PAM4 (28 Gbps NRZ) applications. 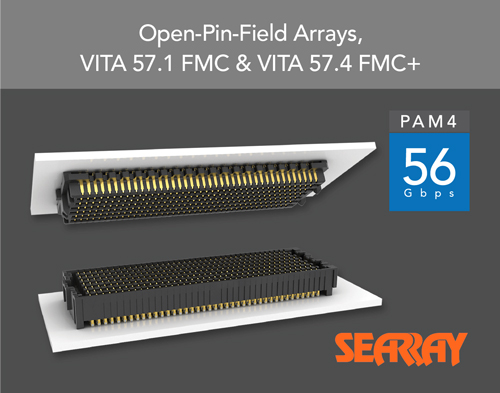 SEARAY™ Open-Pin-Field Arrays enable maximum grounding and routing flexibility; Low Profile & Ultra High-Density designs are also available. 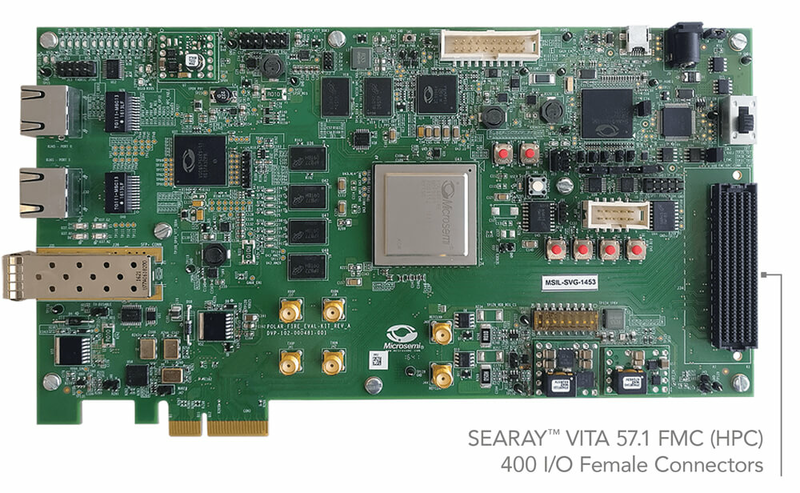 SEARAY™ VITA 57.1 FMC / VITA 57.4 FMC+ connectors are engineered to aid in application development. View additional details at: samtec.com/fmc. Samtec offers a variety of development kits and boards featuring SEARAY™ VITA 57.1 FMC and VITA 57.4 FMC+ connectors that are designed to help simplify design and reduce time to market. View details and additional kits at samtec.com/fmc or samtec.com/fmc-plus. Samtec Signal Integrity Evaluation Kits help simplify the design process and reduce time to market. Kits are available for many of our high-performance connector sets and standard high-speed cable assembly configurations. Custom kits are also available. View details at samtec.com/kits or contact kitsandboards@samtec.com for the current list of available kits.